Just because you’re thinking about living and working in the far-off Persian Gulf state of Oman, joining the tens of thousands of your fellow countrymen already there, it doesn’t mean you shouldn’t be thinking about how to save a little of that lucrative salary you’re about to earn for some future rainy day when you return back home. No? Is that no, there are not tens of thousands of my fellow countrymen already working in the country? Or is it no, I’ll be enjoying my better-than-average lifestyle too much to be thinking about any sort of financial savings? Let’s deal with the first point. Oman has a population of just under 3 million people and believe it or not, about a third of them are working expats. The expats come from all corners of the world, but mainly from Britain, America, Canada, Australia, New Zealand and South Africa. Now to the second point, savings with HSBC or some similar international bank. Let’s face it, since the advent of everything online, including online savings accounts, it’s never been easier to put away a little of what you earn every month – even when you live and work thousands of miles away in a foreign country. It can be a hefty chunk of your salary, or so small an amount you would find difficulty even seeing it in your monthly bank statement let alone missing the actual cash. Hey, but you decide, and then let the good folks at HSBC or whoever take care of the technicalities. Yes, it’s hardly rocket science nowadays setting up a simple standing order or auto bank draft. Simply set and forget and then be amazed at how even a little bit of cash can turn into a quite substantial sum after a year or two! But saving for a rainy day is so much more than setting up a savings account. Saving is also a habit, a state of mind, even a way of life if you want it to be. For example, how often do you find yourself with a pocket filled with annoying, jingling coins that are more of a nuisance than anything else? So why don’t you do yourself a favour and ditch the coins. Find a jar, empty vase or other ornament and fill it with your spare change. Fair enough, it’s probably nothing more than small change in monetary terms. However, empty your pockets or purse on a regular basis and watch the small change grow into lots of pounds, dollars, yen or whatever the currency happens to be. Then, when the jar or vase is full, pop along to your bank and put the money into your savings account. It’s a simple idea which over time can pay back some hefty dividends. And you won’t even have missed the money. Easy or what? There are literally dozens of ways you can save money, from cutting down on your drinking and nights out to packing in smoking. Try walking a bit more instead of driving everywhere and save on fuel costs. Shop online for groceries, clothes, books and any other necessary items for the best prices available. Cutting back on your spending and being aware of the things you spend your money on can help you save a lot on your monthly expenses. In truth, it’s never been easier to save money because of the technology that’s available nowadays. All that’s required is determination and a little bit of thinking out of the box to make it happen. Fresh out of ideas? Need more advice? Then feel free to try this. 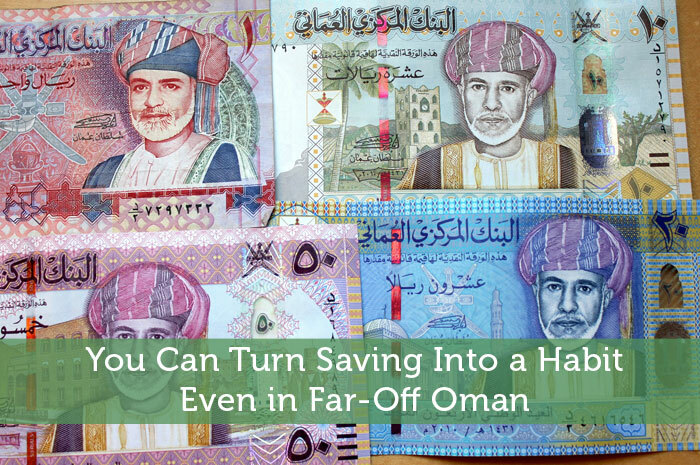 I was under the impression that banks in Oman were not allowed to pay dividends nor charge interest. Still, it’s always a good thing to see how universal the benefits are — as well as the struggle. Well, I don’t know for sure but I think that some do charge interest and or pay dividends, with the high numbers of expats there, probably they have exceptions. And yes, the basics are pretty universal! Even concentrating your hobbies and habits are great ways to save money. For example, my wife does crafts but, when she found she was so spread out, the costs were getting high and time was low she focused exclusively on knitting. Not only are we saving money, time and stress but, she’s making some really great projects! I did the same thing with my book collection. The difference in both cases has allowed us to save more and invest more. It looks like we will even get an awesome vacation out of it at the end of the year! It is a habit that everyone needs to get into. You’ve got to assume that you are on your own for your retirement and you must do everything you can to save for it. It is nice to be in a day and age where you can work pretty much anywhere and have access to banks and other financial resources to help maximize savings. Right on! Saving is a habit that many more people ought to practice. And I don’t think its just saving, more people need to practice the basics tenets of a sound finanical life: living on less than one earns, saving, budget…the basics, but their consistent practice is a path to financial freedom. Oman is a muslim country, interest is not allowed but dividens or profit are allowed!